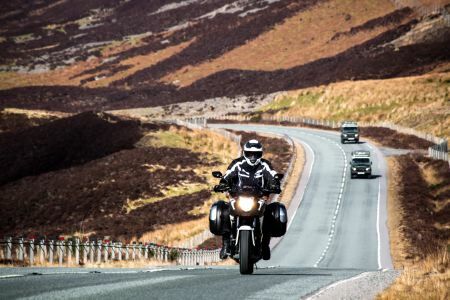 We are a Motorbike Hire Company, based in the heart of Inverness, the Capital of the Highlands of Scotland and an ideal base for starting your NC500 experience. Our aim is to provide self-guided touring by offering motorbike rental and riding equipment to allow you to venture north to experience all that this part of Scotland has to offer. If you’re looking for an awe-inspiring wild landscape, spectacular beaches, impressive Munros to climb, castle ruins or simply want to enjoy the view, then take a trip along the NC500. This is Scotland at its best. Hospitality, lots of space, scenery, small towns and villages to visit, heritage, culture, geology and history to name but a few. So whether you want to cruise the wide open spaces, visit remote locations, experience what Northern Scotland has to offer, trace the footsteps of your ancestors, pan for gold, visits castles, climb mountains, try your hand at loch and sea fishing, visit our remote and unspoiled beaches, then we have the equipment to get you there and the knowledge to allow you to make the most of your trip. Although not on the route, a small detour will see you take in the spectacular Loch Ness and perhaps catch a glimpse of Nessie the Loch Ness Monster. There’s nothing quite like the freedom of the long open road, and we’ve got it all planned out. 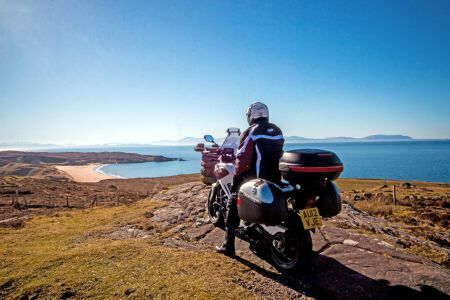 Never-ending back roads through some of the North of Scotland’s finest coastal scenery are what you can expect on Scotland’s brand new tourist route, the North Coast 500. To find out more, check out our key facts or simply hire a motorbike from Inverness now. We are open for Business from Early March , through to mid November. Climb aboard for an unforgettable road trip , the memories will last a lifetime.